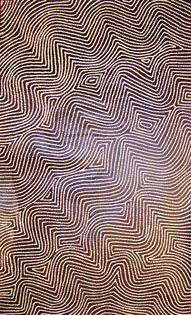 Warlinipirrnga Tjapaltjarri was born east of Kiwirrkura in the late 1950s. 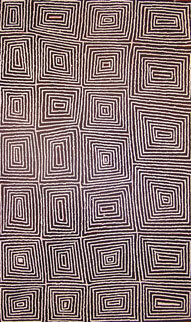 He is the brother of artist Walala Tjapaltjarri. In late 1984, Walala and eight other relatives of the Pintupi Tribe walked out of the desert in Western Australia and made contact for the first time with European society. Described as 'The Lost Tribe', he and his family created international headlines. Until this time Warlimpirrnga and his family lived the traditional and nomadic life of a hunter-gatherer society. Their intimate knowledge of the land, its flora and fauna and waterholes allowed them to survive, as their ancestors had for thousands of years. It is this sacred landscape with its significant sites that Warlimpirrnga so strikingly describes in his paintings. In 1987 Warlimpirrnga completed his first painting for Papunya Tula Artists and in 1988 the First eleven paintings were exhibited at Gallery Gabrielle Pizzi, Melbourne, This entire collection was purchased and donated to the National Gallery of Victoria. Warlimpirrnga exhibited with Ray James Tjangala at Gallery Gabrielle Pizzi in 1999. Exhibitions include 'Mythscapes (1989) and 'Friendly Country Friendly People, (1990).